Michael Evans died ten days ago, of cancer. A veteran newspaper photographer who had been nominated for a Pulitzer, Evans turned down a higher-paying job at TIME magazine to become Ronald Reagan's official White House photographer in 1981 (he left the post in 1986). Ironically, however, Evans' most famous picture of Reagan was one of the first he ever took—on assignment for a horse magazine in 1976 after Reagan's bid for the Republican nomination had failed. (It was the first time the two had met.) 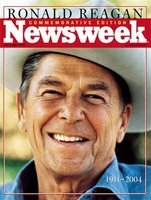 Evans came to national attention again briefly when Reagan died in 2004, when both TIME and Newsweek put his signature 1976 Reagan portrait on the covers of their memorial issues. He was 61.